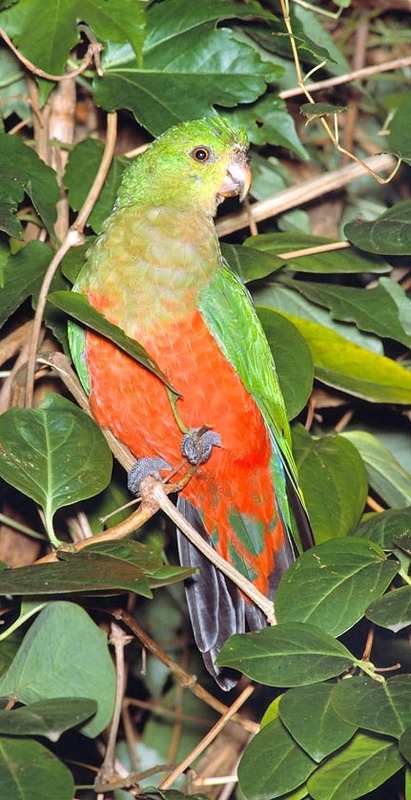 The Alisterus scapularis Lichtenstein, 1818 (Australian King Parrot, or Moluccan King Parrot, or Alisterus amboinensis buruensis) was discovered, studied and bred during his trips in Australia, by the German biologist and zoologist Dr. Sc. Martin Lichtenstein, co-founder along with other biologists of the time, of the Zoo of Berlin and director, in 1813, of the Museum of Natural History of the city. It belongs to the order of the Psittaciformes and to the family of the Psittacidae and is endemic and resident in all eastern Australia, where are found the most numerous colonies, but also in Buru Island, and island of the province of Maluku (Moluccas), Indonesia, former Dutch colony, which got the independence in 1950, and which, from 1965 to 1998 was an imprisonment zone, with a great concentration camp for communists and dissenters. Buru is greatest of the three islands forming the province and it is where is located the 80% of the human population. The mountainous centre reaches the 2.000 m of altitude, and is rich of tropical pluvial forests which are the natural habitat of the species. But the uncontrolled deforestation for creating agricultural areas, has obliged these birds to colonize also other zones, up to the beach, improving their adaptability and getting them accustomed to the man. 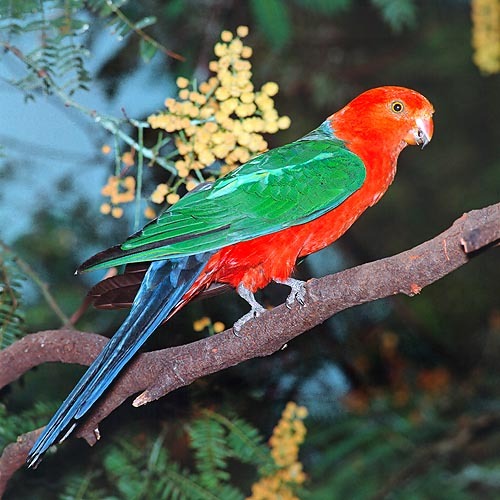 In Australia, groups of medium and small dimensions, often mixed with Rosellas of the genus Platycercus, occupy several regions from the north to the centre of Queensland and to the southern part of Victoria. Though the eastern regions of Australia are their chosen geographic zone, some small groups in freedom have been seen also in Canberra and in the northern outskirts of Sydney. They are little known birds outside Australia and Indonesia. But the remarkable decrement of population during the last twenty years has compelled IUCN to insert them into the Red List, and CITES, along with the Australian Government, to control their exportation for commercial reasons. Unless otherwise obliged, they usually and preferably keep an arboreal life. Authocthonous to eastern Australia and Buru Island, Indonesia, Moluccas. They are birds with arboreal life, preferring the trees of the pluvial forests with great tops, barring to adapt to the new habitats created with man’s deforestation. Adult males and females manifest an evident sexual dimorphism. The males have red head, thorax and abdomen, with bright green back, including the coverts on the wings. Between the red and the green of the back, there is a rather marked blue band and also the great coverts and the rectrices of the tail are of a rather lively blue colour. The males’ beak has an upper orange-red hemi-portion, with a black edge, whilst the lower one of the small, but robust, beak, is black on a fading orange background. The females exhibit a less lively colouration. The head and thorax are pale green, the coverts of the wings are saurian green, the back pale grey with a very reduced or absent blue band, and the big rectrices of the tail are grey. The beak is remarkably faded, yellowish grey. The young, called pullets, of both sexes, have brown iris (which is yellow in the adults), yellow beak and in the temporary feathers, which they will keep till the moulting of the sexual maturity, do recall more the colours of the mother. The Alisterus scapularis have zygodactyl foot, as befits to their arboreal life, and a small but robust beak, suitable for a granivorous and phytophagous alimentation, even if, often, they don’t disdain small salads of petals and nectar. Both males and females can reach the 43 cm of length, the 400 g of weight and can live up to 25 years. There is a subspecies (race) called Alisterus scapularis minor, having quite reduced dimensions in comparison to Alisterus scapularis, and in fact their length is of about 38 cm only, both in adult males and females. They are parrots with a meek character, and emit not much noisy whistles. In captivity, they do not love much to be touched or to be kept in hand, even if they never become aggressive, on the contrary, they take a liking, easily and quickly, for those caring them. But they are not big talkers, or easy to be tamed. They need aviaries sunny and spacious for moving at ease, and even in optimal conditions, they have difficulties in reproducing. Their reproductive biology in the wild is not much known. It is however known that the male, during the reproductive season, builds up the nest, actively courting the female, which lays an average of 3 to 5 eggs, in three consecutive laying phases, which can last for the whole summer. The male provides to the nutrition cares for the pullets and the mate, which clutches for 24-26 days, and then, for about eight weeks, takes care of the protection of the offspring, whilst the male goes around looking for food. At this moment, the pullets are in condition to carry on an autonomous life. They have learnt how to fly and to look for nourishment by themselves. It is not yet clear as to when the sexual maturity happens. It is thought, but the date are still under verification, it’s around the third year for the females and the fourth for the males.